The Brightest LED Bulb For General Use: The SANSI 40W LED Light Bulb is rated at 5500 lumens (approximately equivalent to a 350 watt incandescent bulb). It has a light temperature rating of 5000K or “daylight” quality. It is available for $49. 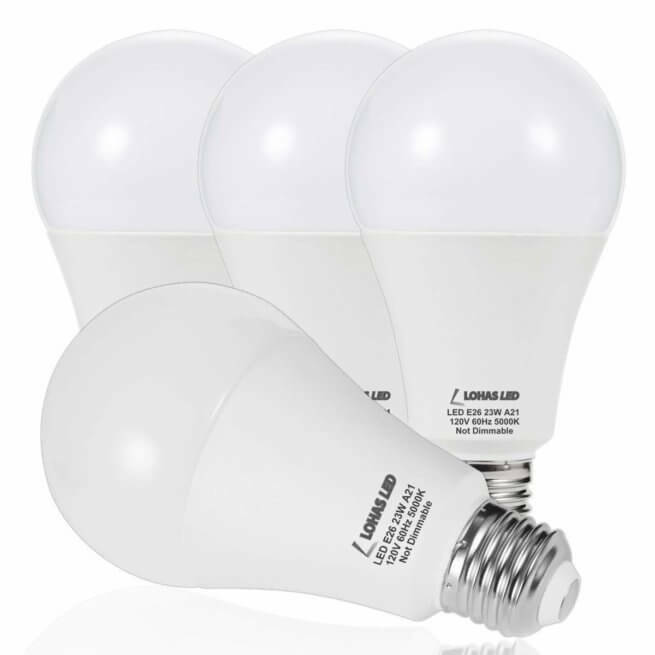 The Brightest For Warehouses\Outdoors (5000K Temperature): This bulb is rated at 29189 lumens. It costs about $170. The Brightest “Warm White” LED Bulb: The SANSI 27W A21 Dimmable LED Light Bulb. This bulb is warm white and produces 3500 lumens. It is available for about $56. The Brightest Standard Size Bulb: The Philips 1220 Lumen LED Bulb is the brightest LED bulb that fits in common household fixtures and lamps. The SANSI 45W LED Light Bulb is a very bright bulb, producing 5500 lumens. Because it is a non-dimmable daylight-style bulb, it is probably best suited to garages and warehouses. It is available for $49. The SANSI 27W A21 Dimmable LED Light Bulb is a warm white bulb and produces 3500 lumens. I have one in laundry room and it produces a very bright pleasing illumination. I wasn’t able to install in a ceiling fan fixture, because it is was slight too large. It is available for about $56. The LOHAS A21 LED Light Bulb is rated at 2500 lumens, making it the brightest standard sized (A21) LED light bulb on the market. It uses 23 Watts and it has a 5000K color temperature (daylight white). It is suitable for outdoors area and garages. If you need warm white bulb for interiors, see the Philips bulb below. The Philips 100w Equivalent LED Bulb is another standard-size household bulb available. It uses 18 watts of power to produce 1620 lumens of warm white light. I have many of these in my home, and they produce an excellent quality light (the CRI is 80). These bulbs are also dimmable, and rated to last 22.8 years. It is is available from Amazon for around $21. The Color Rendering Index (CRI) is a numerical system that rates the “color rendering” ability of light bulbs in comparison to natural daylight. If a light has a low color rendering index of 50, it does not render colors very well. If the lamp has a color rendering index of 80 – 95, its ability to render colors is thought to be very good to excellent. A CRI of 100 is considered natural daylight and is assigned to the sun itself. The Color Temperature is expressed in Kelvin (K). Low color temperature implies warmer (more yellow/red) light while high color temperature implies a colder (more blue) light. Moreover, the “color temperature” of a lamp refers to how reddish, greenish or bluish the lamp appears. If the lamp appears reddish, it has a lower color temperature (e.g., 2500K-3000K) and is considered to be “warm” in appearance. If the lamp appears to be bluish, it has a higher color temperature (e.g., 4000K-4500K) and is considered to be “cool” in appearance. Widow. Needing outdoor Solar security light for farm driveway. Sale please. Linda@jim-r.com. thanks. Philips always has this amazing bulb! I just ordered these bulbs from amazon. LOHAS A21 LED Light Bulb. The have 2500 lumens and 5000k temp. Should be great in outside socket. I bought these bulbs the other day and they are awesome. very bright. I’m sorry, but I wouldn’t consider a CRI below 90 to be acceptable, let alone “excellent”.You can easily get LED bulbs in the 92-95 CRI range, why would you settle for less just for some extra lumens? Could you please provide a recommended bulb that is over 2000 lumens with a CRI 92-95? I am burning out my eyes trying to find the max light for an E12 candelabra base and a 7 watt limit. So far, 650 lumens has been it, and not on any local shelf! Cree said they passed 300 lm/w, but their offering was a 350 Lumen 5 watt 40 watt equivalent! Can either of these bulbs be hung from a ceiling and pointed downwards? They can I have them in my ceiling fixtures — they are heavy however. My mom has macular degeneration and every bulb we have purchased is not bright enough for her. Can we use this light in a lamp in the house for her? Is the Philips bulb an E27 fit?